I tried a new grain for breakfast today! Nowhere on the front does it say “farina”, but that’s what it is! I loved it! The texture was that of oat bran and it got so thick! I’m lazy, so yes, I did cook it in the microwave. 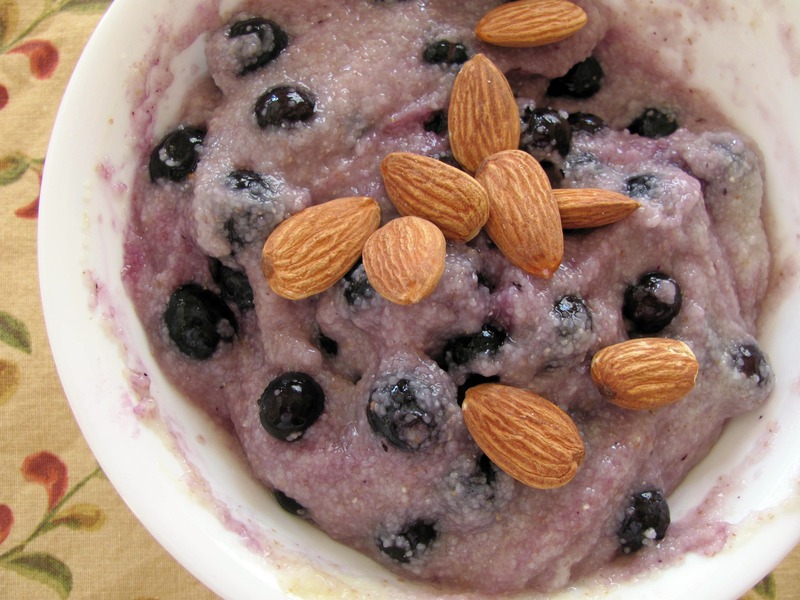 After it was cooked nice and thick I stirred in a ton of frozen blueberries, (which cooled it off nicely!) and topped it with a few roasted almonds. Tasted like a Blueberry Muffin! I forgot who it was, but someone left a comment a while ago saying I could use my waffle maker as a panini press! Isn’t it the cutest little sandwich you ever did see? But what really counts is in the inside. Peanut butter, banana and, I was feeling crazy, so some unsweetened carob chips! ← My Steps To Clear Skin! I love farina! The meal of my childhood, sprinkled with come cocoa 🙂 Delicious. 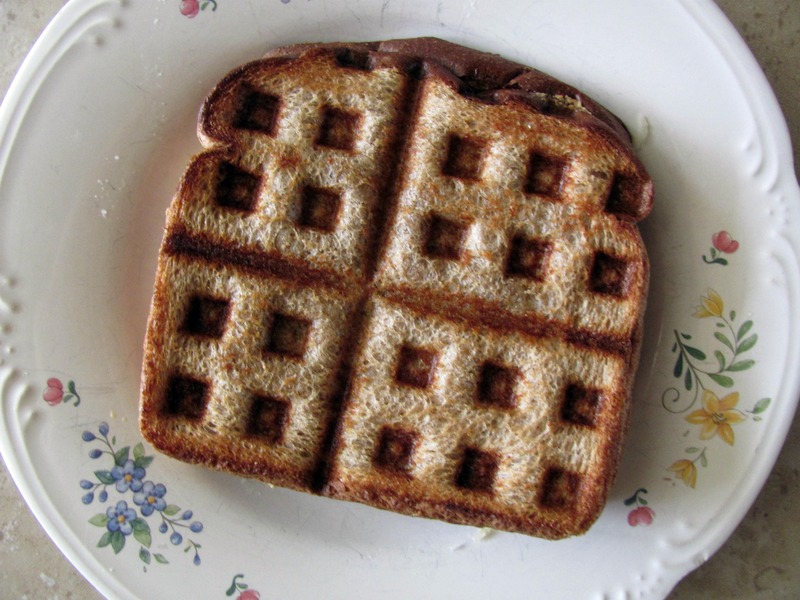 Waffle makers are great for making paninis! That waffle sammie is hilarious! What a great idea! And I’ve never had farina before. Does it take long to cook? The farina is actually quicker than regular rolled oats! Yes, you are what gave me the idea! Ohh that looks good. I want to try it! Oh wow! That totally is the cutest (and most delicious) sandwich! I’ve never thought of using a waffle maker as a panini press, thanks for the idea! And thanks for reminding me that I actually love farina! There are so many good grains out there, that I tend to forget about a lot of them. That is so creative that you used your waffle maker as a panini press! I can’t wait to try this, it would probably save me money from buying yet another kitchen appliance. ive heard so much about farina!!! AHAH I LOVE ur creativity with the waffle maker! genius! 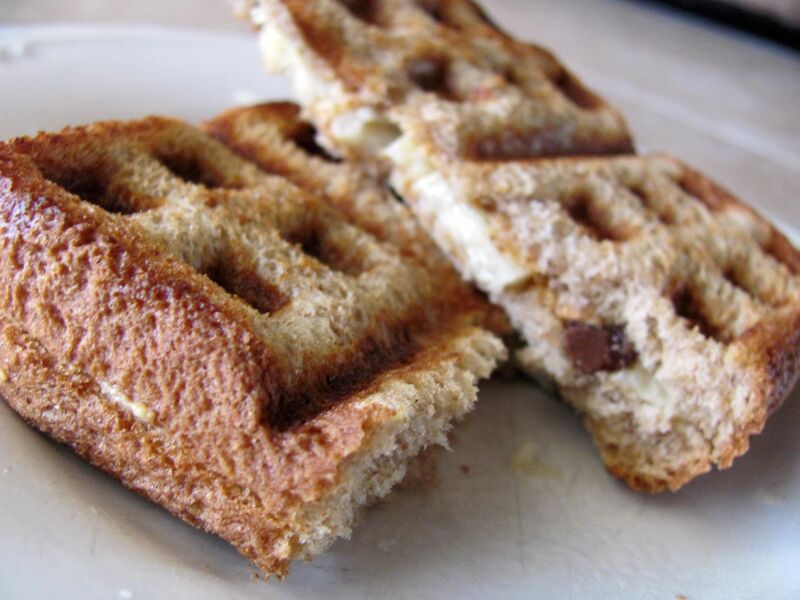 I absolutely love the idea of using a waffle maker as a panini press! I definitely have to try that out. 🙂 You’ve also given me major cravings for a pb & banana sandwich. I haven’t had one in so long and it sounds really good right now. I’ve always been interested in that stuff! I used to love grits and all that so Malt-o-meal seems like it’d be a good alternative. I used to do that before I got my panini press. I’ve used the waffle iron to make french toast and grill veggies too! It’s actually quite versatile! The farina actually looks really good, it kind of looks like oat bran. Does it taste similar? Malt o meal is farina?! Who would have thought . Good to know its a winner! I love cream of wheat!! You’re right…it is SO creamy and thick! That sandwich looks just how I like ’em….CRISPY!!!! 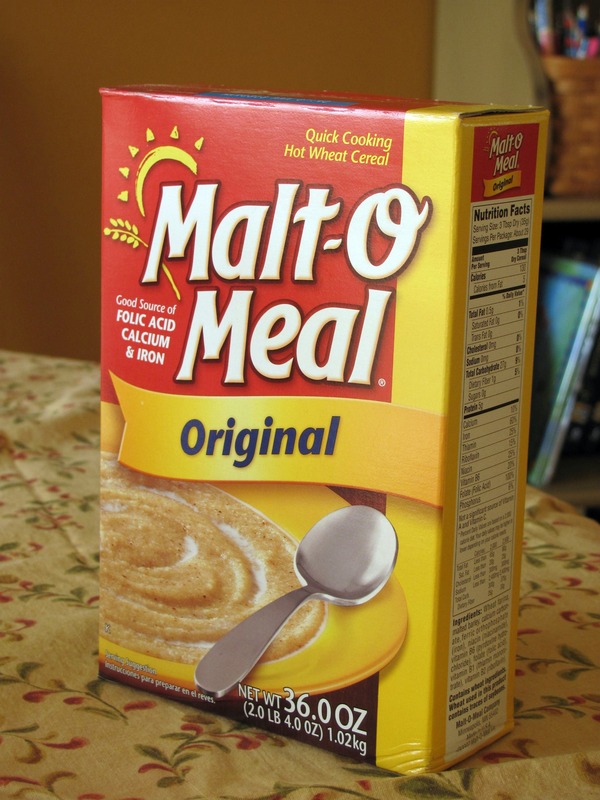 I love Malt-o-Meal!!! It’s such a delicious hot cereal! My waffle maker can be used for other things? Wow that is single handely made my life ha. To think I could use it for every meal. I had faina in Puerto Rico and loved it so much I hoarded about ten cases of it in my suitcase. What can I say…I’m obsessesive. Brilliant idea with the waffle press for sandwiches. I seriously need to buy a waffle press. And a Garmin. And a KitchenAid, lol. that is THE cutest sandwich!!! love it! That is an adorable sandwich!! Ahhh ive seen that before in the US, we cant get it in the UK i dont think 😦 i really want to try it too, it looks so yummy snif. Oh myyy GAWWDD!! That is so so genius! I am totally making myself a waffled panini for lunch today! AH so excited!! And that farina bowl looks great, I’ve never seen it in a box like that! I’ve never heard of farina, but it looks delish! And I am literally loling over your “panini,” it’s so cute! That is a brilliant idea – what a cute panini!